Porcine parvovirus (PPV) is a very common pig viral disease that causes reproductive failure or infertility in female breeding pigs. Because pigs are so important in the agricultural industry, PPV is a potentially serious and harmful disease that requires proper understanding and management. The parvovirus is a very small, single-stranded DNA virus in the family Parvoviridae, whose many different strains can infect different species of animals, such as dogs, cats, wolves, foxes and pigs. In pigs, PPV is common worldwide and will most likely be present in any tested porcine herd. The virus is incredibly hardy; it is resistant to disinfectants, widespread, and can live outside a pig for up to 100 days. For these reasons, it is difficult to remove from the environment. Pigs may be infected with PPV without the virus becoming pathogenic. 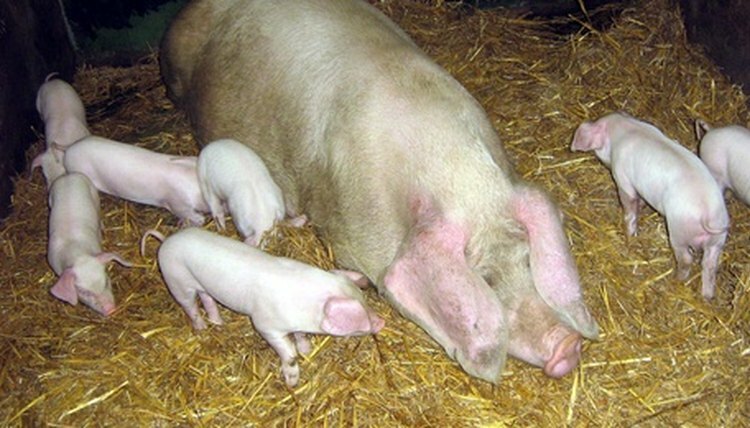 However, the virus causes disease when an unimmunized sow or gilt becomes infected for the first time while pregnant. Infected pigs shed the virus in feces and saliva. The pregnant female pig ingests or inhales the virus which will circulate through the bloodstream and cross the placenta to the fetus. However, not all embryos or fetuses will become infected. Depending on the stage of fetal development at the time of infection, PPV can cause various problems. If the mother is infected within 30 days of pregnancy, either infertility or embryonic death can occur. Infection between 30 and 55 days of pregnancy can cause fetal mummification, which is the solidification of the skeleton and digestion of the fetal tissues. Infection after 55 days of pregnancy, during the later stages of development, piglets may be born infected and weak or stillborn. Upon exposure to PPV, a pig has immunity for life. Any piglet born infected with PPV may exhibit maternal immunity for up to seven months of his life. There are no physical symptoms of PPV, only clinical signs, such as reduced litter size, increasing number of stillbirths, mummified piglets, and possibly low birth weight piglets. PPV diagnosis can be made from these signs in addition to laboratory tests, such as immunofluorescent microscopy, virus isolation and antibody tests. Because of the prevalence of the disease and the lack of treatment, the best way to manage PPV is through prevention by vaccination. If breeding pigs are vaccinated twice, a couple of weeks apart, several weeks before breeding, active immunity will develop, which will protect the fetuses. A booster may also be given every six months thereafter.